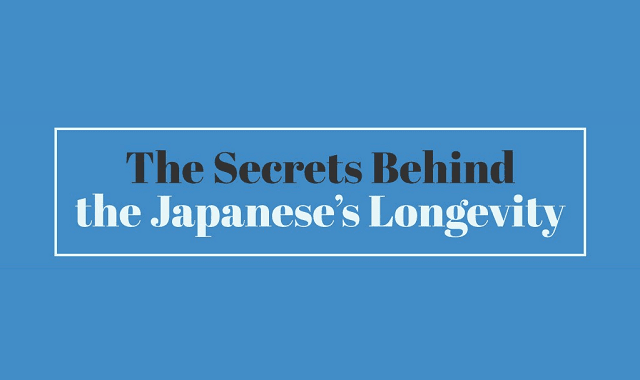 The Secrets Behind the Japanese's Longevity #Infographic ~ Visualistan '+g+"
Did you know that the Japanese have the second highest life expectancy in the world? Japan is the only big country in the top 5 longest living nations. The rest (Macau, Monaco, San Marino and Singapore) are city states. The average life expectancy of a Japanese is 85 years. Japanese women live up to 88 years on average and Japanese men live up to 81 years on average. What is remarkable is that they live disability-free and relatively healthy up to 75 years. Plus, there are low rates of adult obesity, cancer and heart disease in Japan. How do the Japanese do it? The Japanese’s high life expectancy can be traced to their longevity diets, of which the Okinawa diet is the most well-known.